I’ve had this model for some time now and was not really happy with the finished product for a couple of reasons. One reason was that I wanted it finished in Gold and the acrylic gold I used was pretty hopeless, being very grainy. 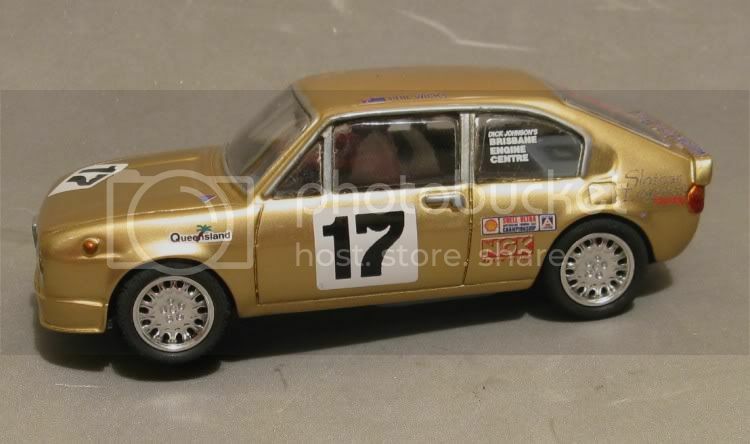 The other reason was that although I had lightened the body to some ridiculously low weight and fitted an SCX motor to keep the weight down, the model still decided to hop over onto its side without the slightest provocation. Obviously too grippy in the tyre department. 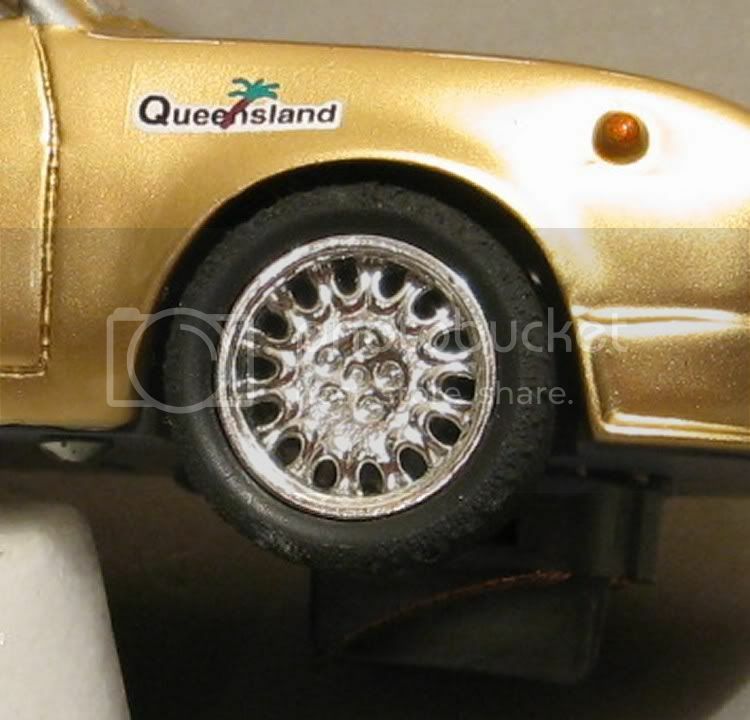 I then tried the original Cartrix tyres (to match the wheels) and found it to be much improved. Then, one day at the Red Team’s home track, I grabbed it from the race box and plonked it on the track for some hot laps and maybe a race even, when it just sat there spinning its rear wheels!! ‘Sacre Bleu as Napoleon once said’. It had only been a matter of a week or so and the rear tyres had gone from Oh so nice to Oh so hard!!?? So hard in fact that they disintegrated when trying to remove them!! By this time I was not laughing. Next up was a set of old faithful SCX type sevens, the cure for most small slot models on a board track, but, double sacre bleu with knobs on!!! The model resorted to its erstwhile previous incarnation of Mr Roll over without provocation!! Despondent, I retired the model to the shelves for a considerable time. I could possibly have fixed it up then and there but I had other models in the queue and the paint job had me beat. So that was it, until a couple of months back. Having established a new work regime which only required me to go twice a week I started to split up the remainder of the week into my favourite pastimes like fishing, walking, trivia nights, slotcar racing and scratch building. 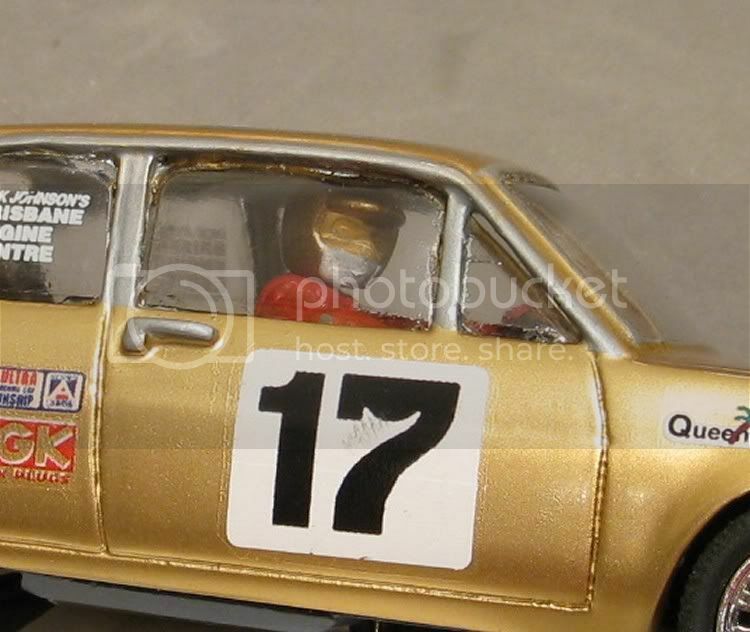 It wasn’t long before the backlog was cleared and a gap appeared in the slotcar part of the week. To top it all, wifey had bought some gold paint to garnish a few jaded vases about the place. Once applied I was mightily impressed with the gold and was a bit miffed that the regular hobby paint makers couldn’t supply the same quality. 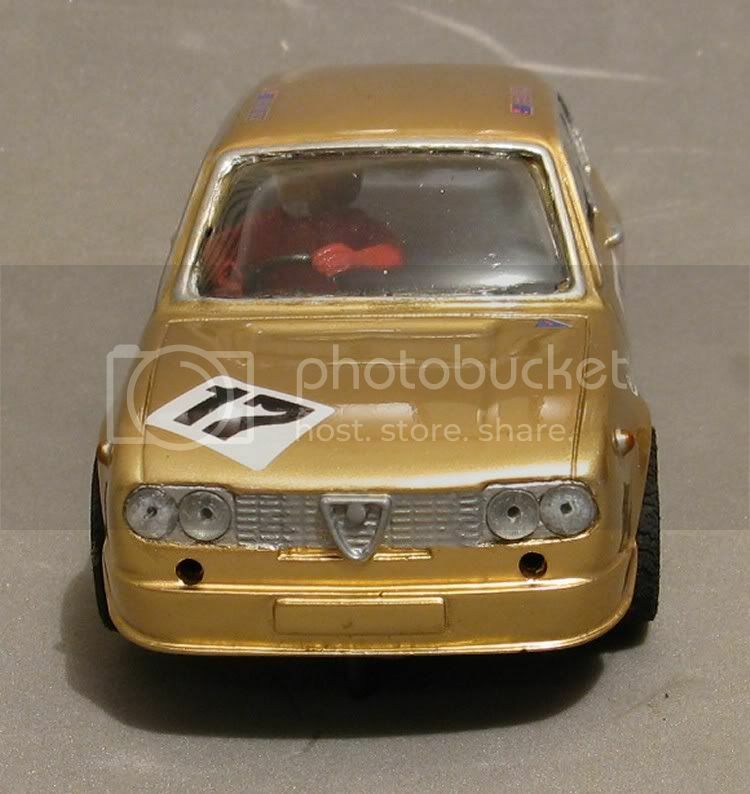 So, the Alfasud got stripped back to bare resin and I started again. This time I was a bit more enthused. The Body was primed and snagged and then it was time for it’s first coat of paint. The paint came in aerosol form. This was decanted into a paint bottle and sprayed on with a pencil gun. Beautiful!! The sparkle and shine I wanted in the first place was there. After the gloss coat came a coat of clear enamel. The decals were some left over Patto’s place decals and these got a coat of decal fixer and were applied a couple of days later. The next and last coat of clear enamel was applied and the whole model shone. 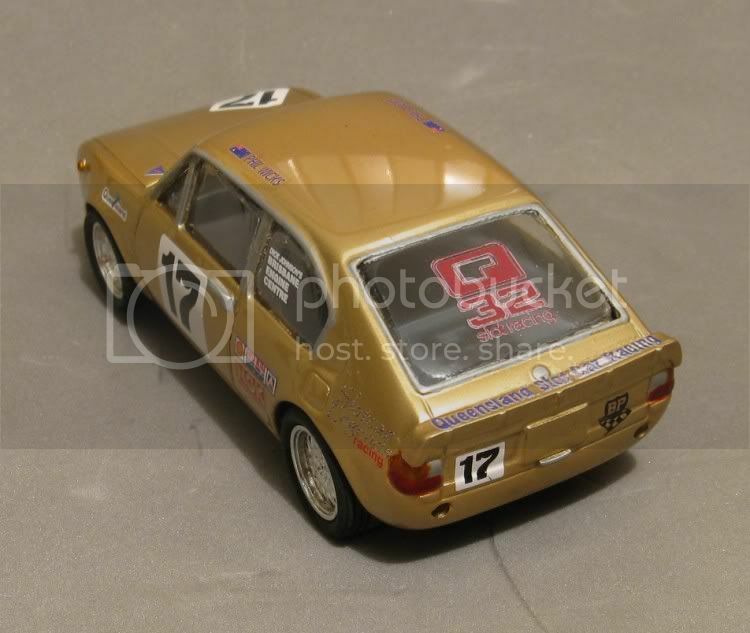 This time I left off the pewter bumpers that Ocar provided as European racing cars very rarely raced with bumpers on. The only niggle was the fact that I had epoxied the clear screens in and they would not be coming out. I managed to mask them fairly well but if you get too close you can see the joins. Last up was the tipping problem. This I cured by sanding quite a large radius on the SCX tyres at the back. This had the effect of reducing the track contact area and the model was more inclined to break away in corners rather than roll over. 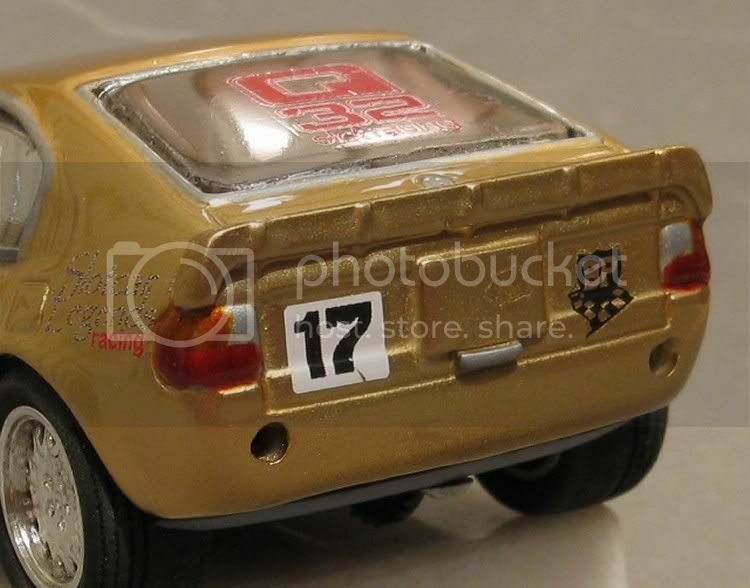 So that was it, the model was a fabulous gold and it now went round corners at a respectable speed. Mmmmmmmmmmm! It was all a bit of a rush job and more an exercise in gold painting hence a few daggy spots and slapdashery here and there. The grille wants another coat and the lights front and rear want tidying up. The paint was a household enamel - ‘White Knight’ gold from the local hardware store. As for the rest of the model. 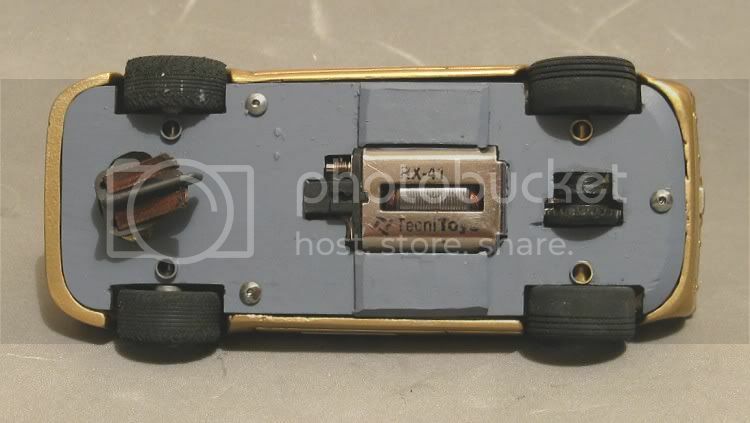 The wheels are Cartrix Alfa wheels from Cincyslots, the driver is a half Fly driver from Cincyslots and the rest is a Wixwacing PCB chassis. Needless to say, the model is now back in the race box!